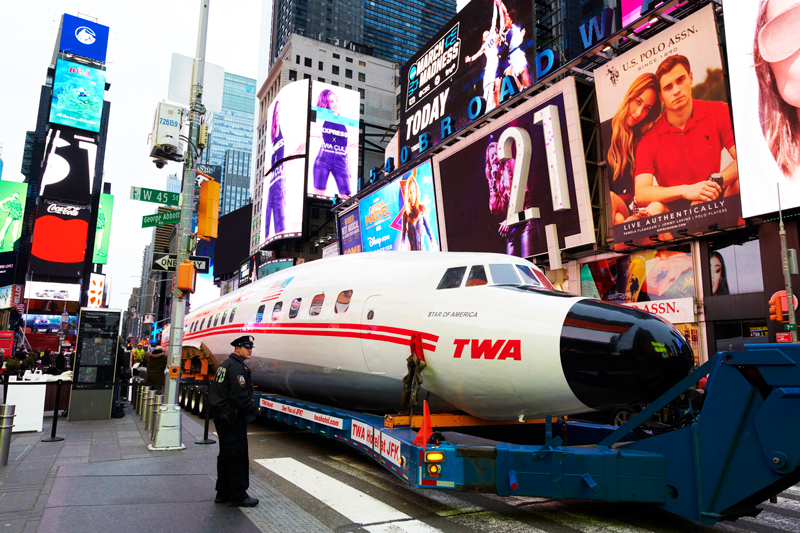 The propliner’s fuselage spends the weekend of March 23 and 24 at the NYC spot where TWA’s eight-story, lightbulb-studded Connie billboard once hung. 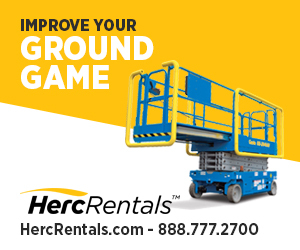 Lights, Camera, Airplane! The TWA Hotel’s 1958 Lockheed Constellation rolls Into NYC's Times Square. Only in New York: The 1958 Lockheed Constellation “Connie” airplane bound to become a cocktail lounge at the TWA Hotel — the only on-airport hotel at JFK — will park in Times Square at Broadway and 45th Street on Saturday, March 23, and Sunday, March 24. 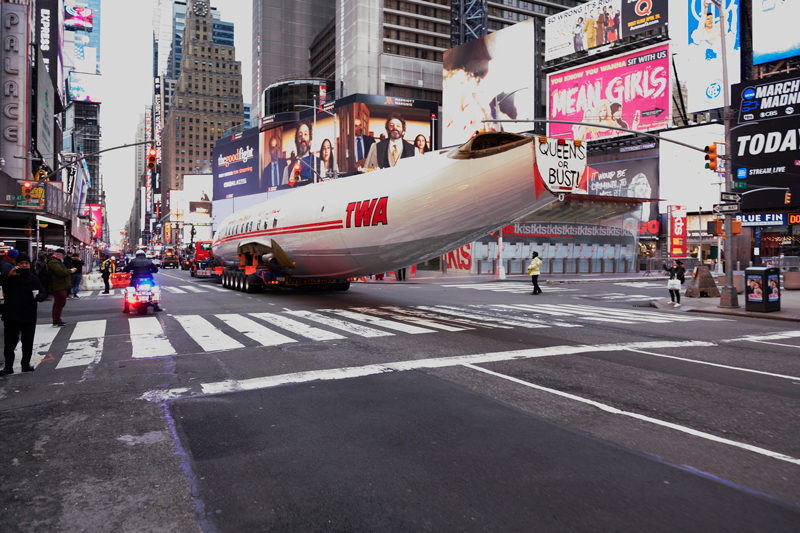 The fuselage of the fully restored plane, which was disassembled and trucked from Maine in October 2018, rode from JFK Airport on Friday, March 22, to Avenue of the Americas and Canal Street. 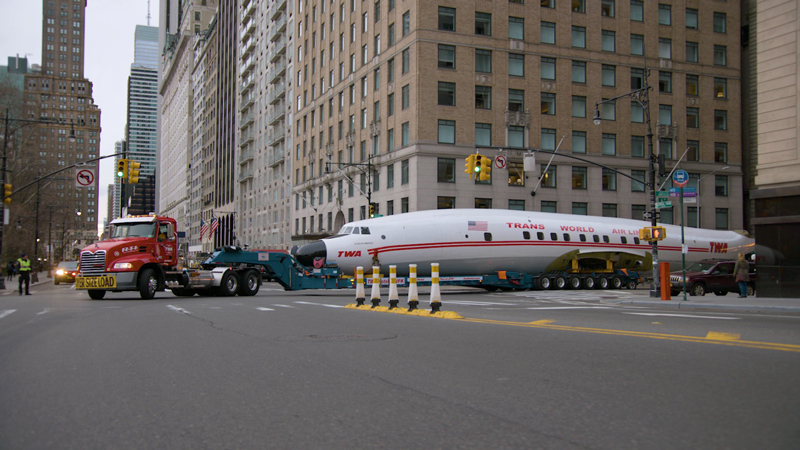 After spending the night in the city that never sleeps, the fuselage — carried on a trailer by Worldwide Aircraft Recovery, Ltd. — made its way up Avenue of the Americas, through Columbus Circle and down Seventh Avenue before landing at a pedestrian plaza. The Connie swings onto 59th Street on her way to Times Square. Connie’s spin through New York City is being filmed for the upcoming documentary The Rebirth of the TWA Flight Center helmed by Peter Rosen, celebrated director of 2016’s PBS presentation Eero Saarinen: The Architect Who Saw the Future. 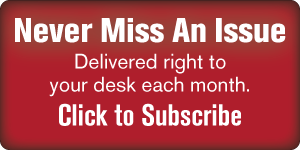 Suite Spot, an NYC production company, is capturing the move from land and air. Chronicling the transformation of Finnish architect Saarinen’s landmark 1962 TWA terminal into the 512-room TWA Hotel — which opens May 15, 2019 — the documentary also traces the history of the building, which was designed around the Lockheed Constellation airplane. A national treasure that helped New York City usher in the Jet Age, the TWA terminal was designated a New York City landmark in 1994 and listed on the National and New York State Registers of Historic Places in 2005. The TWA Hotel’s Connie flew into John F. Kennedy International Airport (then named Idlewild Airport) while it was in service as a Trans World Airlines passenger plane. The 116-foot-long plane with a 150-foot wingspan was so special to TWA that, in 1955, the airline erected an eight-story billboard of the Constellation in Times Square on Broadway and 43rd Street. In addition to a two-fifths scale Connie model with a working propeller, the billboard had 20,000 lightbulbs and 50 miles of electrical wiring for a total electrical load of ½ million watts! Though Connie did make it here, she couldn’t make it anywhere: the billboard came down in 1960 just as Connie was replaced with a jet that flew 300 MPH faster. She went on to serve as an Alaskan bush plane and a marijuana dropper before being rescued by MCR/MORSE Development, who partnered with Atlantic Models/Gogo Aviation to restore her to her original condition. 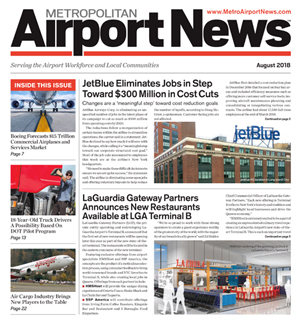 When the plane’s fuselage returns to JFK Airport on Sunday evening, Connie will undergo her final makeover into a cocktail lounge on the tarmac outside the TWA Hotel. Starting May 15, 2019, guests can order drinks and snacks inspired by the 1960s and check out the cockpit, which has authentic, flippable switches and controls.